Johnny Chan was born in Canton, China but moved with his family in 1962 to Hong Kong, then in 1968 to Phoenix, Arizona and later in 1973 to Houston, Texas where his family owned restaurants. He was going to continue in the family business, but when he was 16 he went on a junket to Las Vegas, Nevada. When Johnny was 21 he dropped out of the University of Houston, where he was majoring in hotel and restaurant management, and moved to Las Vegas to become a professional gambler. Chan, known as The Orient Express, attributes some of his early success to the fact that many players had not previously played against Asian players before. He shot to fame in the late 1980s, winning the championship event of the World Series of Poker (WSOP) in two consecutive years (1987 and 1988). He almost won a third consecutive title, but finished in 2nd place in 1989 to Phil Hellmuth. Jerry Buss, owner of the Los Angeles Lakers, promised Chan an NBA championship ring if he could win three in a row. Buss is an avid poker player. As of 2005, Chan has won 10 World Series of Poker titles, tied with Doyle Brunson for the record. He was inducted into the Poker Hall of Fame in 2002. 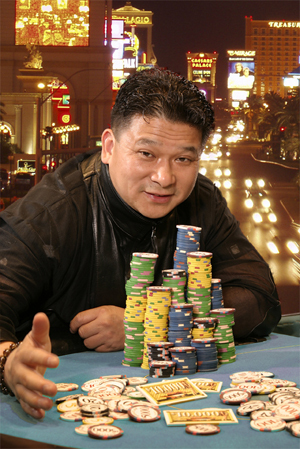 Johnny Chan competed in the $400,000 Poker Superstars Invitational Tournament in February 2005. He came back from only having $20,000 chips out of $3,200,000 in play to finish in second place to Gus Hansen. Chan is known for keeping a “lucky” orange in front of him on the table, and after the second consecutive WSOP title other players began bringing fruit to the table in hopes of increasing their luck. Chan says he only had an orange with him because of the pleasant scent, as smoking, which was allowed in many tournaments then, bothers him. Chan was once a smoker, but now he neither smokes nor drinks alcohol. In addition to playing poker, Chan owns a fast-food franchise in the Las Vegas Stratosphere Hotel and is a consultant for various casinos and game makers. He has aspirations of opening his own casino. Chan has also written for Card Player magazine. A video clip of the 1988 WSOP final heads up match is featured in the movie Rounders, in which Johnny Chan makes a cameo appearance. Chan has six children. He relaxes by swimming, playing pool and bowling. In 2003, Johnny won the 34th annual WSOP’s $5,000 No Limit Hold ‘em and $5,000 Pot Limit Hold ‘em just days apart for a total winning of more than $382k.